Don't wear these. Just don't. We've found them. We've found the worst thing you can possibly choose to wear to the Calgary Stampede this year. Move over, bedazzled cowboy shirts and crushable cowboy hats. Step aside, barely-there daisy dukes and Canadian tuxedos. These horrible monstrosities trump every other Stampede fashion faux-pas out there. For $50 US, Scotty Franklin of Springfield, Missouri will customize your cowboy boots, cutting away the upper and fashioning them into flip flops. They're "this summers most functional and fashionable statement!" 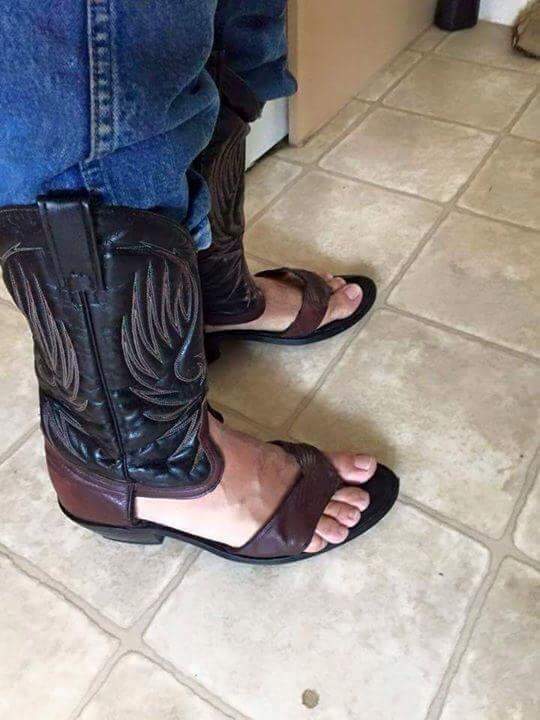 he declares on the Facebook page for Redneck Boot Sandals. Ummm, let's agree to disagree on that, Scotty. We will admit that it's hard for feet to breathe in a pair of leather cowboy boots. But, surely, there must be a better way?